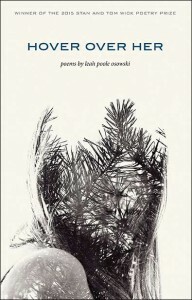 Author Leah Poole Osowski is from Massachusetts. She received an MFA in Creative Writing from the University of North Carolina Wilmington where she was a reader for Ecotone magazine. Her first book hover over her won the 2015 Wick Poetry Prize, chosen by Adrian Matejka. Her work has appeared or is forthcoming in Black Warrior Review, The Cincinnati Review, Hotel Amerika, The Journal, Mid-American Review, Salamander, and Third Coast, among others.